The first thing I noticed about this HP printer was its overall sleek design, making it appear as if it had been designed by Apple rather than in a former Soviet Bloc tank factory. Looks aside, the HP Photosmart B8550 offers features such as dual paper trays and a built-in card reader with a 2.4″ LCD that’s designed to allow printing without a computer (though I don’t see a pro using that feature). The B8550 uses a dye-based, five-ink printing system to produce archive-quality images with an expected 100-year lifetime, which is a lot longer than the life span of any client. I had some doubts about how prints would stack up against printers offering more inks, but I was pleasantly surprised at how good the B8550 prints appeared. The colors were vivid and the detail was sharp. The B8550 uses a dedicated black cartridge for nonphoto work, which means I can use the same printer to print invoices from the main paper tray and photos from the upper photo tray (max size 5×7″) without swapping paper—a very thoughtful feature. (The lower tray can also be used to print photos.) 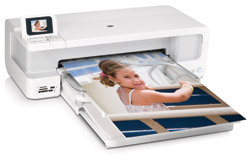 The B8550 can print images up to 13×19″ (super tabloid). When printing standard photo sizes, the speed of the printer and cost per copy appear competitive with others in its class. Could you please quote the price of consumables for the Hp photosmart 8550 printer and the number of various inks to me. I have only had my hp b8550 for a couple of days. I have thus far printed 2 4×6 prints and 1 13×19 print. I use it with my iMac 24″. My photo editor is Adobe CS3. I have the printer set to let the printer manage color. My results are absolutely fabulous. Colors are perfect. I was using a Epson CX 7400 prior to this HP. I compared the identical print albeit two different sizes and in comparrison, the Epson print was flat and looked like it lacked contrast. The HP is vivid and brilliant. My very first print straight off printed perfectly. I had one printing error but it was my fault. The paper tray had slipped a bit after I loaded paper and I was unaware of it until I tried to print. I was thinking it would be nice if that tray had a lock that required a press of a tab or something to move it. But once a person is aware of how it works it is easy to watch for. I was unsure of what to expect from a wide format printer under $200.oo but I can assure you my apprehen sion has faded entirely. This is a great addition to my iMac because it looks classy and more importantly, it is a great performer. I highly recomend it for anyone who has a desire to conveinently produce stunning prints for framing and to sell. I have just purchased this printer – haven’t received yet. I plan to use it to print photos on fabric for quilt making. Any thoughts on the durability of the ink if washed. I will use specially prepared fabric sheets and heat set my photos once printed. I bought this printer a couple of months ago and I have been very pleased. As has been said, the results can be just outstanding. I have recently changed my color profile setting in Adobe CS3 and now I need to figure out where it was so I can get back to those same results. Maybe I just need to set it back to letting the printer manage colors again. paper trying to get what I see on the monitor. I have two computers on windows y the other XP and PSE 8 they both printed very well on my old Hp printer. This new one is terrible. don’t know what adjustments to use, must use let printer make choice as I can’t figure out how to shut down the drivers and go with let PS choose colors. HELP, I am ready to throw it away.